In double talk detection, we wish to find a metric that will separate single talk speech from double talk speech. To do so, we need to find a measure of similarity between the near end and far end speech. When this measure indicates the two signals are dissimilar, double talk is detected. One method of doing so is to compute speech features for the far end signal and compare them with the near end signal . Where ob is the estimated variance of the noise, and ß is a constant also given in . Under voiced speech, this decision variable was compared with a given threshold, and under unvoiced speech, the variable as compared with another threshold. From here, the decision was made. The authors show that using speech features for double talk detection is a useful method, as their double talk detector outperformed both the normalized cross-correlation and Geigel algorithms. The speech features given in  were largely dependent on the energy of the signal. This means that the performance of this double talk detector will severely degrade under noise. In addition, the reliance on an decision threshold that varies between voiced and unvoiced speech presents another dimension of error that may degrade the performance even more. Using VOCAL Technologies superior understanding of speech features, we can offer much superior performance in the presence of noise, reverberation, and non-linearities. 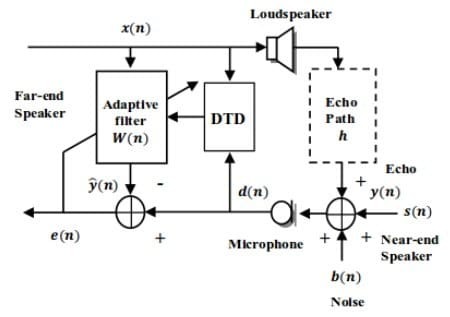 M. Hamidia and A. Amrouche, ”Double-talk detector based on speech feature extraction for acoustic echo cancellation,” in Software, Telecommunications and Computer Networks (SoftCOM), 2014 22nd International Conference on, Split, 2014, pp. 393-397.